As Holocaust Remembrance Day approaches on 27th of this month, remarkable stories continue to emerge from the darkest period of human history and its aftermath. One such story follows the death of Edgar Hilsenrath on 30th December 2018. Having witnessed and survived its horrors, he became known as a writer of ‘unvarnished Holocaust novels’ – novels that differed significantly from more moderate accounts of what happened. “My friend, the words you have just translated to me are indeed beautiful. We, the few survivors coming to these shores, are indeed poor, tired and yearning for freedom. 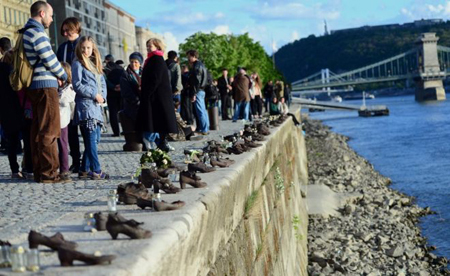 A contrast to the stories of survivors is this week’s news that Israelis are going to scour the Danube River in Budapest, Hungary, searching for the remains of Jews who were shot on its banks in late 1944 by pro-Nazi Arrow Cross fascists. Many Jewish people consider it vitally important for a person’s remains to have a proper burial. Thus it was that a most unusual ceremony took place this morning, in which members of the United Synagogue in the UK received the remains of six unknown Holocaust victims, which are to be buried in a historic service in Bushey New Cemetery on Sunday. Those remains were stored in the archives of the Imperial War Museum for 20 years, having been recovered from the Auschwitz Birkenau Concentration Camp. Reading some of these stories can prompt extremely strong emotions. But it is also extremely important that we do not let the atrocities committed in the Holocaust be forgotten. Otherwise there is a greater chance of similar things happening again.